Scrum Developer Certified (SDC™) is an entry level certification for Scrum Team members and those who interact with any Scrum Team. The objective of this certification is to ensure that Scrum Team members know enough about Scrum to effectively contribute to a Scrum project. There is no formal prerequisite for this certification. Scrum Master Certified (SMC™) professionals are facilitators who ensure that the Scrum Team is provided with an environment conducive to completing the project successfully. The Scrum Master guides, facilitates, and teaches Scrum practices to everyone involved in the project; clears impediments for the team; and, ensures that Scrum processes are being followed. This certification is appropriate for anyone who is interested in working as a Scrum Master. Rapid changes in technology, market demands, and expectations have paved the way for the conceptualization and implementation of agile methods and values in many organizations. Agile relies on adaptive planning and iterative development and delivery. It focuses primarily on the value of people in getting the job done effectively. Agile Master Certified (SAMC™) Certified Professionals should appreciate the concepts of Agile development and have the ability to compare and choose the Agile methodology appropriate in a given situation. This certification is appropriate for anyone interested in getting familiar with the concepts and practices of Agile Project Delivery, and who wants to have a working knowledge of the various Agile methodologies. The Product Owner represents the interests of the stakeholder community to the Scrum Team. The Product Owner is responsible for ensuring clear communication of product or service functionality requirements to the Scrum Team, defining Acceptance Criteria, and ensuring those criteria are met. The Product Owner must always maintain a dual view. He or she must understand and support the needs and interests of all stakeholders, while also understanding the needs and workings of the Scrum Team. This certification is for anyone who interfaces with stakeholders or works as a Product Owner in a Scrum Team. Implement best practice back on the job using these large Vinyl Scrum boards. Qith quality eyelest and printed on thick vinyl, these help you bring the methodology to life - and keep it top of mind. 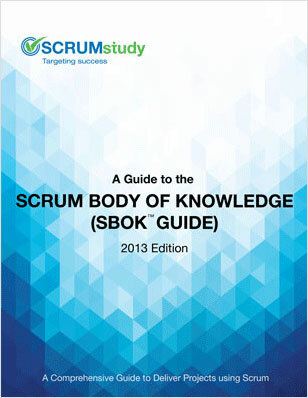 A Guide to the Scrum Body of Knowledge (SBOK) provides guidelines for the successful implementation of Scrum-the most popular Agile project management and product development methodology. It provides a comprehensive framework that includes the principles, aspects, and processes of Scrum. The term 'product' in this Body of Knowledge may refer to a product, service, or other deliverable. Scrum can be applied effectively to any project in any industry-from small projects or teams with as few as six team members to large, complex projects with up to several hundred team members. This first chapter describes the purpose and framework of the SBOK™ Guide and provides an introduction to the key concepts of Scrum. It contains a summary of Scrum principles, Scrum aspects, and Scrum processes. The following sections are covered in this chapter.